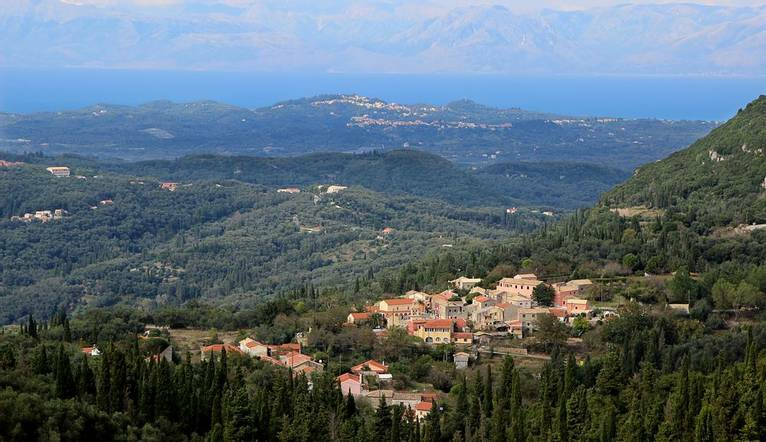 The Greek island of Corfu is a walker’s paradise – join us for a magnificent journey along the beautiful Corfu Trail with its spectacular scenery! The Elea Beach Hotel is located in a great spot on the promenade and the beach in Dassia with breathtaking views over the Ionian Sea. Dassia is a bustling resort offering an array of shops, bars and restaurants and will provide a fantastic base for your walking week. After exploring the medieval mountain village of Xlomos, we walk through olive groves and along a ridge enjoying stunning views of the West coast until we reach the spectacular sandy beach used in the filming of James Bond’s For Your Eyes Only. After stopping for a taverna lunch by the sea, we continue through the dunes to beautiful Lake Korission, home to a vast array of birdlife. Starting high in the mountains at the village of Pelekas, with spectacular views in all directions, we will walk through a beautiful ancient olive tree forest before we continue along one of the prettiest sections of The Trail, along a delightful pathway, passing some spectacular ancient rock formations before we reach the hidden settlement of Stavros. A spectacular walk in the mountains! Beginning at the Byzantine Monastery at Mount Pantokrator with incredible views across the whole island, we descend through the Karst Plateau along the ancient rough tracks used by countless packhorses, passing wild, moonlike scenery as we walk. There will be time for a pitstop in Spartillas before we journey down to the coast for lunch at a beachfront taverna and a refreshing swim. The Elea Beach Hotel is a family run hotel, with a very friendly atmosphere and located directly on the beach. From the terraces we can enjoy lovely views over the bay to the mainland as well as Corfu Town. Facilities include two sea front swimming pools with Jacuzzi, hotel bar, beach bar, wellness room, fitness room, newspaper shop, wifi, restaurant with show cooking, and a la carte beach tavern (daytime). Our rooms include A/C, Satellite TV, telephone, refrigerator, safe deposit box (additional cost), hairdryer, WiFi, and balcony or terrace. The transfer from Corfu Airport the hotel is approximately 30 minutes. Four guided walks are included in the programme. Your walking guide will advise you in resort of the daily programme. The walking programme is graded as Medium and you can expect to walk between 10 to 14km per day, with some ascents/descents, rough underfoot terrain and high altitudes involved.